This past long weekend was so nice and super relaxing – we really didn’t do much except shopping, brunching, and grilling a ton. In fact, we made pizza’s for the first time on the grill and they turned out awesome! I also made this grilled corn/kale salad with a cilantro vinaigrette that was killer. But alas, we didn’t take pictures of any of these delicious meals so I can’t post them. I am going to try and remake in the coming weeks so I can share! I did want to post something from this weekend and last night I decided to try something fun and new for a snack that could also be a good go-to appetizer option for when we have people over. 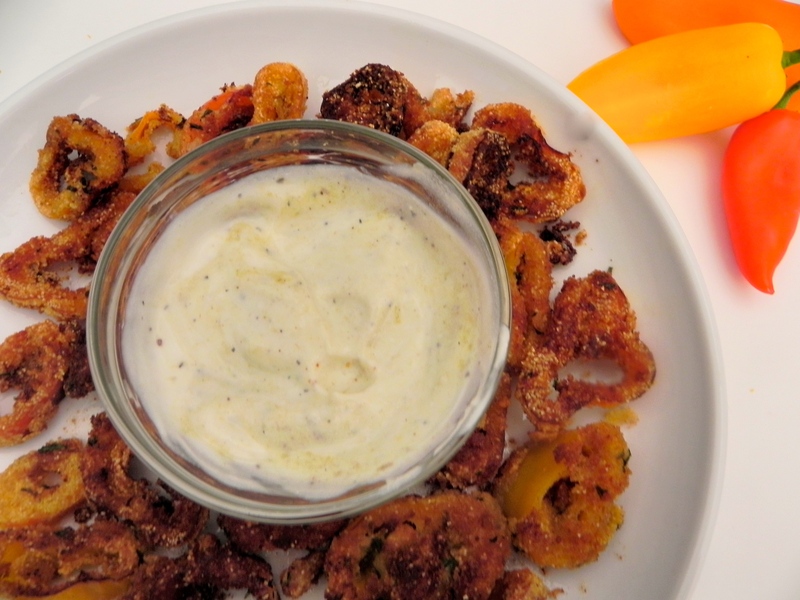 These fried bell pepper rings tasted like onion rings but with a sweeter taste. They were tiny, so it is a perfect finger food. My husband grilled some jalapeños over the weekend and made a sauce with it so I used that to make the dipping sauce by adding some sour cream to cut out the heat. It was a perfect sauce for these rings!